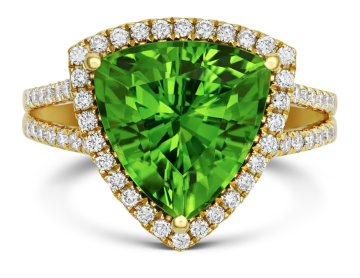 The August birthstone is the peridot, so we’re taking an in-depth look at this beautiful stone this month. The peridot is one of the only gems that exist in just one colour, a signature olive-green hue that makes it distinctive from other stones. Peridot is a gem-quality, magnesium-rich variety of olivine that can be found in lava, in pallasite meteorites and in mines around the world. This stone also has a rich cultural significance in different countries, making it a powerful symbol for many and perfect for your jewellery collection. While the exact origins of the name peridot are not certain, many believe that it may have come from the Anglo-Norman pedoretés. Others believe that it is derived from the Arabic word for ‘gem’ (faridat) or from the Greek word ‘peridona’ (‘giving plenty’). The earliest use of peridot’s English name dates back to 1705, although its Latin denomination may have first been recorded in 1245 in the register of the St Albans Abbey. In Hawaiian folklore, the peridot symbolises the tears of the goddess Pele, deity of volcanoes and fire. Peridots have been associated with light for a very long time. In Ancient Egypt, they were called ‘gem of the sun’ and mined on an island in the Red Sea called Topazios (also known as St John’s Island or Zabargad); for this reason, peridot was labelled as topaz for many years. Cleopatra is famously known for having owned a vast emerald collection; however, the stones may have actually been peridots. For a long time, especially during the Middle Ages, people mistook peridot with emerald. This precious gem is one of only two to form within the planet’s mantle instead of its crust; the other one is the diamond. Peridot forms in the upper mantle around 20 to 55 miles below ground (sometimes, it can also form at a depth of 100 to 150 miles). Natural volcanic activity brings this stone to the surface, though peridot can also be mined. Today, the peridot mainly comes from Arizona, but it can also be found in China, Myanmar and Pakistan. The gemstone has been mined for over 3,500 years, but its production only increased in the last hundred years. 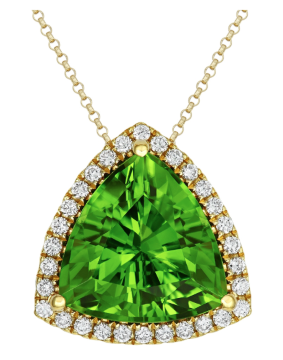 Colour – Peridots may only come in one colour, but the tint and intensity of the hue can vary. This is due to the percentage of iron present in the crystal structure, which can create colours that range from yellowish to olive and brownish-green. The most valuable and sought-after colour is a dark olive green. Carat – It’s relatively common to find peridots smaller than three carats; however, those over five carats are rare and have a higher value, and peridots ranging from 10 to 15 carats are an even rarer occurrence. Clarity – Most peridots of gem-quality are translucent and clear to the naked eye. Under a loupe, this stone may appear to have inclusions inside, which doesn’t detract from its value if they can only be seen with special equipment. Cut – When it comes to cut, peridots are usually faceted, as they can easily be cut into several different shapes due to their remarkable transparency. Popular cuts include oval, cushion, emerald, beads and dome-shaped cabochons. Hardness – Peridot ranges from 6.5 to 7 on the Mohs scale of hardness, meaning this precious gem is perfect for being set into several different types of jewellery, from rings and bracelets to necklaces and earrings. Shrine of the Three Holy Kings – For a long time, it was believed that the superb 200-carat gems decorating the shrine of the Three Holy Kings in the Cathedral of Saint Peter in Cologne, Germany, were emeralds; eventually, they were found to be peridots instead. There are more than 1,000 of these striking gems adorning the Shrine. Russian Crown Jewels – The peridot became more popular in the 1800s and today is still a prized gem for many. In the Russian crown jewels, found in the Kremlin, you can see a beautiful clear olive-green peridot that weighs a stunning 192 carats. Ottoman Ceremonial Throne – Peridots were also a prized stone in the Ottoman Empire; the best example is the gold throne located in Istanbul’s Topkapi Museum, which is decorated with 955 gorgeous peridot cabochons. Habsburg Peridot Parure – Once owned by Archduchess Isabella von Cröy and worn by Joan Rivers, this is a complete parure of peridot jewels containing a tiara, a necklace, earrings and a brooch. It dates back to 1825 and is attributed to Köchert, who became jewellers to the Habsburgs. Smithsonian Peridots – The Smithsonian possesses some of the world’s most famous peridots. One of them weighs 46.16 carats and was extracted in Pakistan. Another of these precious gems also found in the Museum’s collection weighs 34.64 carats and is set in a necklace; it was found at San Carlos Indian Reservation in Arizona. Also, in the Smithsonian is a modified triangular-cut peridot from Pakistan that possesses a highly prized, intense dark green colour and great brilliance, and weighs 100.15 carats. This stone is sometimes referred to as the ‘evening emerald’, and it’s a stunning gem with a rich history that makes a gorgeous addition to any jewellery collection. Peridot is also the traditional gem for 16th wedding anniversaries, so what better way to celebrate your love for your partner than with this beautifully vibrant stone? At Banks Lyon, we offer jewellery featuring the lovely August birthstone that will perfectly complement your wardrobe and sit beautifully on your skin. If you would like to see other birthstones, we have an extensive range of birthstone jewellery that makes a beautiful gift for someone you love or just as a treat to yourself.